Do you toss and turn? Have trouble falling asleep after 10pm? Fall asleep only to wake up with a racing heart? And then stay up hours. Do you wake up just as tired or worse than when you went to bed? How can it be that you are exhausted but can’t sleep? Consult your healthcare provider before starting any treatments. Some causes can’t be removed or it takes a long time to do so. 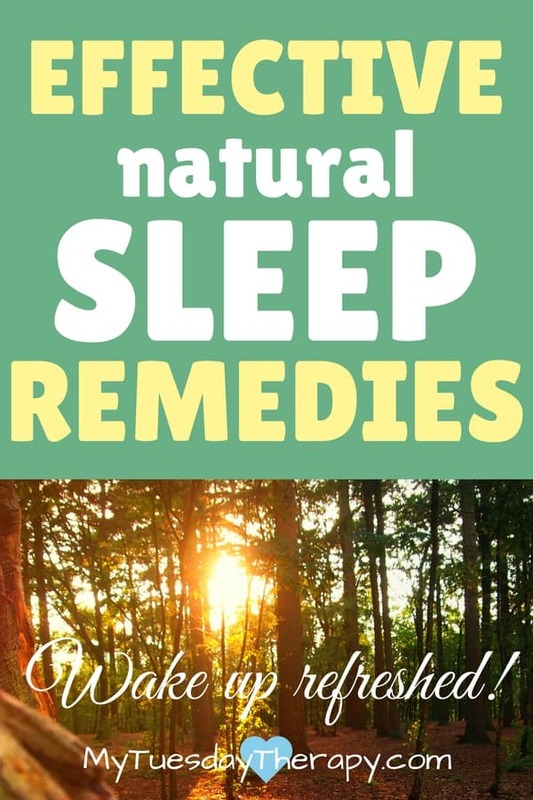 In those chronic cases and sudden short term situations natural sleep remedies can come handy. I struggled with chronic insomnia for two decades. Mine was caused by adrenal fatigue and everything that goes with that condition. I had trouble falling asleep and staying asleep. It took me a long time to get to the point of sleeping well and waking up refreshed. I tried various natural remedies for insomnia and found some that worked for me. 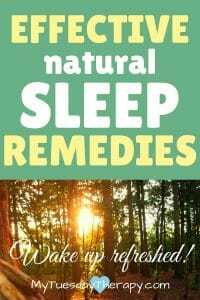 Though this post was written with adrenal fatigue (stress syndrome) sufferers in mind, the natural sleep remedies mentioned are not only for that condition. Suffering from severe insomnia is really bad for your health. It gives your heart a resting period for your blood pressure goes down and breathing slows down. During the deep sleep your muscles relax and tissue grows and is repaired. The white blood production can go up so you can better fight viruses and bacteria. The glymphatic system is activated. This system removes waste from the brain just like lymphatic system gets rid off it from other organs. During that time, your cortisol levels are naturally the lowest. But if the level goes too low, your blood sugar level could drop too. Cortisol aids in the blood sugar regulation so they can go hand in hand. The dip in glucose level causes your body to produce adrenaline and it tells your body that you need to eat to bring up the blood sugar level. So, you could look at it as a protection mechanism. I used to keep nuts or other snacks on my night stand for the in the middle of the night glucose level drops. Severe adrenal fatigue is fatigue that won’t go away with a good night sleep or two… or several. If you have a mild case, the best thing you can do is to sleep and sleep. You should also sleep as much as you can when you have a severe adrenal fatigue. It just won’t be a quick fix but it will help in your recovery. Your body does a lot of healing while you are sleeping. The best way to cure adrenal fatigue insomnia: heal the adrenals. I used these Essential Adrenal Supporting Supplements . We live in a such a toxic, hectic world that many of us need some adrenal support. But until your adrenals are doing well you still need to get some … a lot of sleep. As I mentioned, I suffered from insomnia for a couple of decades. It was horrible. I was so tired but couldn’t sleep. My sleep was never restful. I used to get heart palpitations when I lay down. Kind of hard to fall asleep when your heart is pounding. And often after I managed to fall asleep I woke up with a racing heart. I found myself in the frustrating position of being exhausted but unable to sleep. But realizing that I needed to sleep in order to heal, I looked into natural ways to help with the problem. I read on many sites that “go to bed before 10″. Or “go to bed when you feel sleepy”. That one can be tricky if you are a mom of small children. Usually, I was at the point of collapsing out of exhaustion at bed time. Peaceful bedtime routine… for your kids too. Check out the Stress-Free Bedtime Routine for Kids for some cool ideas. Avoid watching TV or being on screen right before bed time. The blue light makes you more alert and suppresses the melatonin production. Which makes it harder to go to sleep. I have heard that some wear blue-light blocking glasses if they must use phones, tablets, laptops at night. They even have blue-light blocking clip-ons. Take a nice, warm bath. Some like the relaxing effects of Epsom Salt baths. Those were too much for me. I took one and was completely wiped out after it. I thought that my heart would stop beating. Have your spouse stroke your back. Listen to soothing music (Bach, Handel, Vivaldi). Do some breathing exercises. These breathing techniques have helped me a lot! Press acupressure points. This acupressure book is very helpful. You can find the points I pressed in my Daily Routine (part 2). Eat some honey and a tiny bit of salt at bedtime. Open the window for few minutes to let in some fresh air. Spend time outdoors during the day to keep your circadian rhythm functioning. These natural cures for insomnia were part of My Evening Routine that included acupressure points, a yoga pose etc. Check it out and maybe you’ll find some tips there that will help you too. The ones that worked best for me were Deep Sleep and Native Rest. The latter being my favorite of the two. I used Native Rest successfully when traveling to Finland and dealing with the 7-hour time difference. Too much of melatonin can cause opposite reaction. So start with a small amount. I used 1-3 sprays of Native Rest. Occasionally, I still use Native Rest or Essential Oils: Good Night or Sleep Ease. But most nights I can sleep well without sleep aids. It is an awesome feeling to wake up feeling refreshed! Sometimes it can be good to switch between the sleep aids. Use one for a while and then another. Whatever works for you. Three for the price of two and free shipping! Dr. Sears has a special promo on Native Rest. If you’d like to take advantage of that, click on the picture. Don’t get discouraged if healing takes a long time. The damage usually doesn’t happen over night, neither does the healing. It can take months or years to get to the point where you can sleep without sleep aids. Even though I began sleeping better with the help of the supplements, I was exhausted for a very long time. Don’t give up. Make getting adequate amount of sleep a priority and enjoy better health and more energy. Wishing you peaceful, healing sleep and sweet dreams. 20 pages to help you to create a plan for Feeling Better.